Hudiksvall Hospital will be the third hospital in Sweden to deploy the Swedish Modules concept featuring prefabricated, modular operating theatres. This will enable the hospital to continue providing essential surgical and orthopaedic care while its permanent facilities are extended and upgraded. As a result, Hudiksvall can fulfil the vital role of maintaining standards for patients while ensuring a good work environment for employees. Amid global competition, Swedish Modules has secured the public procurement contract to build six operating theatres for Hudiksvall Hospital. Scheduled to be leased by the County Council for a two-year period, the operating theatres form part of a wider hospital project and will enable the temporary provision of surgical and orthopaedic care while the hospital completes construction of the permanent facilities for these disciplines. While the construction of new and permanent spaces is under way as part of the wider project, the facility must continue to fulfil its mandate according to the same standards. 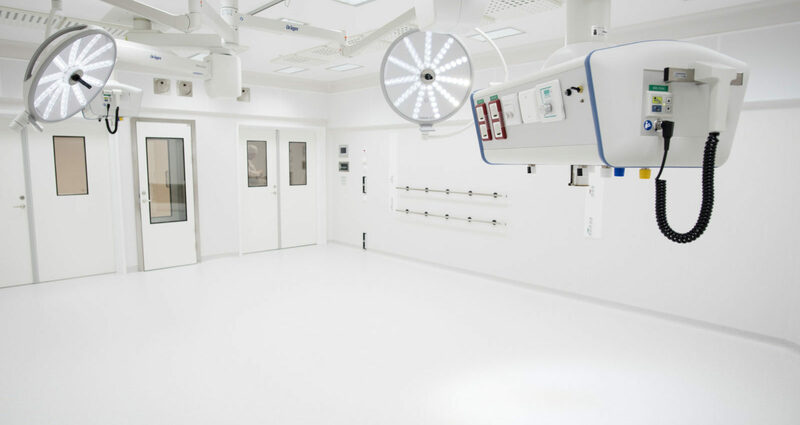 Karlskoga Hospital has previously maintained good patient safety and fulfilled its duty of care by performing surgery in modular operating theatres provided by Swedish Modules. In the autumn of 2018, Södersjukhuset Hospital became the most recent facility to begin using operating theatres provided by Swedish Modules. It’s really satisfying to once again provide operation theatres which meet the highest standards while the existing hospital is being modernised. It’s important for us to be able to offer a good work environment that we know will make a difference to employees and patients. Thanks to extensive development work alongside professional experts in the field, we are also able deliver this to our clients. The specifications for these modular operating theatres are exactly the same as those for permanent operating facilities. One of the greatest benefits of this concept is that the modules can be reused for surgical activities elsewhere after having fulfilled their function for the hospital. This contributes to increased sustainability from both financial and environmental perspectives. Construction of the operating theatres for Hudiksvall Hospital will get under way in the first half of 2019 and is set to be completed by the end of the year. The plan is for the operating theatres to be used by the hospital for ordinary activities from 2020 to 2022, at which time they will be disassembled as the new premises get up and running following the end of the rental period. Swedish Modules delivers prefabricated, high-specification modular structures within our business segments, Medical and Datacenter & Power. With over 40 years’ experience in modular construction, we’ve provided upwards of 3,500 high- quality modules to more than 30 countries all over the world. We develop and manufacture solutions adapted for critical societal infrastructure and constantly strive to create greater function and value for our customers and their business. All our modules are manufactured in a safe work environment at our factory in Emtunga. Swedish Modules has offices based in Emtunga and central Stockholm.